Hi! Many months ago I was sent these lovely paper lashes from KKCenterHK and it was only recently that I was able to do a proper makeup look to go with them. 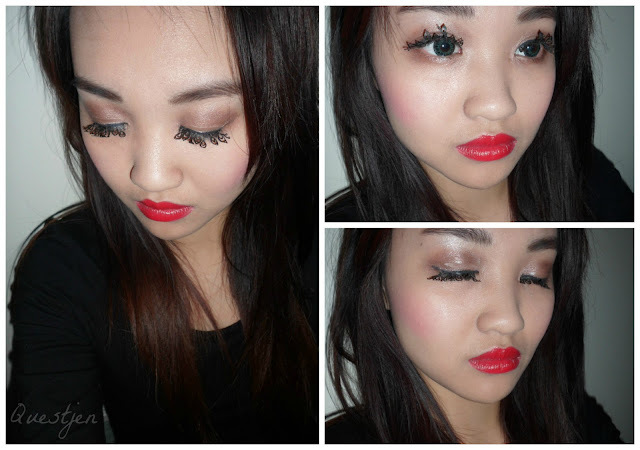 This was my first time using paper lashes and I had no idea if I could pull off wearing them without seeming odd! Of course, I was never brave enough to wear these lashes out but I decided to be brave enough to share how I look with these on. I trimmed the lashes slightly, to be a better fit on my lash line. I wore them without wearing any eye makeup to see how bold they looked on me... and yes they did stand out! I also used double eyelid stickers to raide my crease. I have naturally tapered eyelids and I felt that these lashes would look better on parallel eyelids (which is seen above). Unfortunately I realised that after I trimmed them, the peacock design became hardly noticeable :( Also I had thought that paper lashes would be very fragile and thin but with these ones they were quite flexible and can still be reused as they maintained their shape. I did a brown smokey eye and applied eyeshadow under my eyes to give the appearance of a smouldering look. It was a lot of fun to do and I made sure that my eyeshadow wasn't as bold as my lips or else it may have turned into a chaotic, overloaded bold mess! 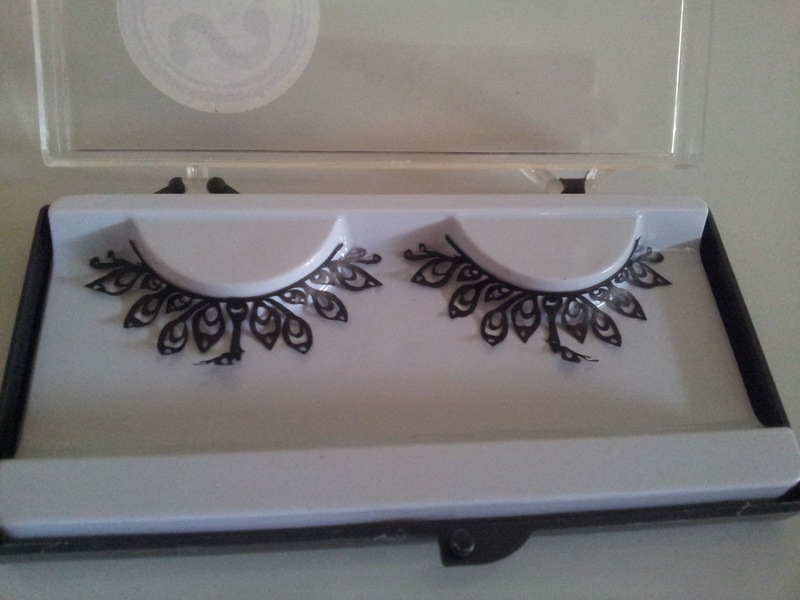 What are your thoughts on paper lashes? HELLO! It's great to be back after roughly two months of not blogging :) I didn't intend to be away for this long but I got to a point where I really needed to sort out my priorities and figure out how I wanted to manage/use my time wisely. Yes I know, blogging for me and for many is purely a hobby... but a very time-consuming hobby. I was lacking in time and therefore could not fit in blogging into my schedule. Not to worry now though, as I am back and have pretty much all the time in the world for the next few weeks ^^ A few weeks is better than nothing, right? Quick update for anyone who's interested - a fair bit has happened during my hiatus (not intending to be dramatic, just saying)... I became a year older and out of my teens, the boy and I celebrated being together for half a decade, my only active lens sponsor mukuCHU closed down and Google Reader discontinued at the start of this month. Now I encourage you to use Bloglovin' if don't already, to stay updated with your favourite blogs. Hopefully one of them is mine (why else would you be here... haha). Click here to follow me, thanks! Ah, and also during my hiatus I made a discovery... of Honey Beige BB creams! 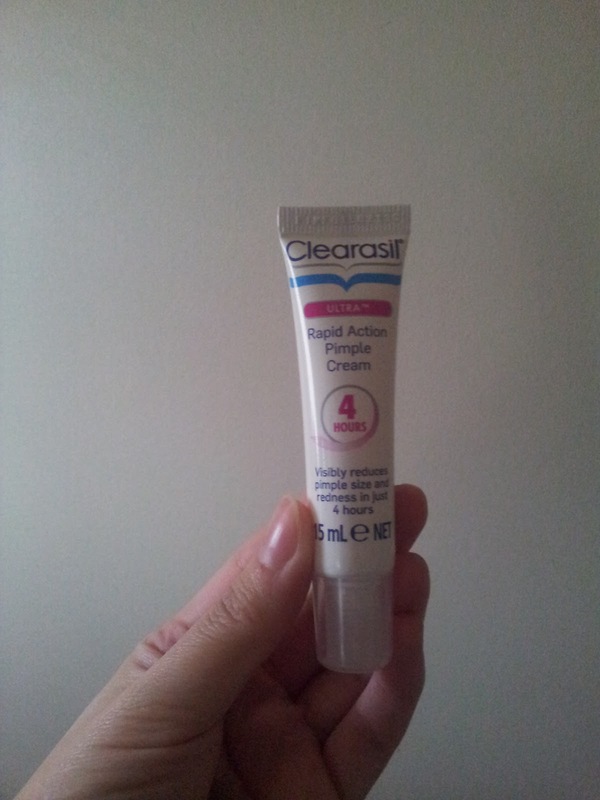 In case you're unaware, the typical 'Asian' BB creams usually cater for those with fair skin which has always made me feel rather left out... because I'm more on the medium side. I'm not a fair-skinned Asian and I've accepted the fact that I'll never be one. It's nice how the Western BB creams have medium shades to suit a wider variety of skin tones but personally I feel that the quality of theirs haven't quite reached the standard of Japanese and Korean ones. 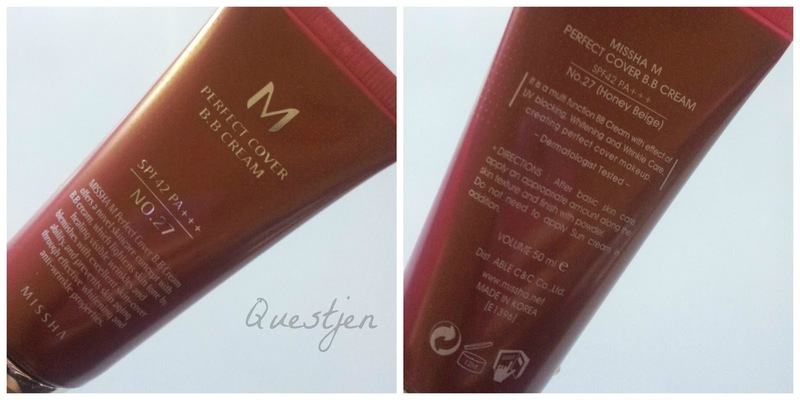 For example, the Garnier one just feels like a tinted moisturiser, offering minimal coverage. The light-medium shade matches me quite well but in terms of overall quality and coverage it doesn't quite cut it for me. 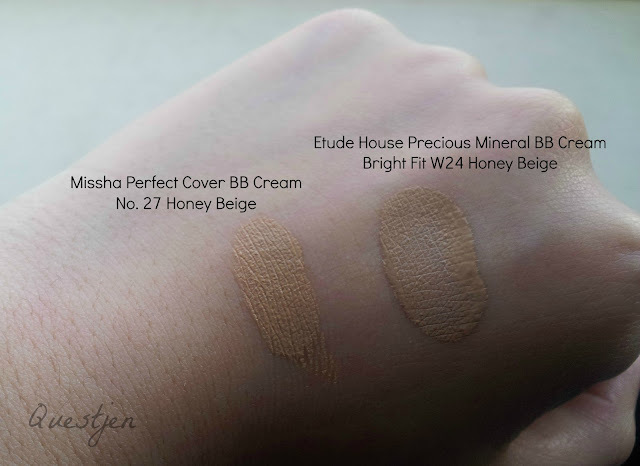 So I did a little bit of research and discovered that Missha has a Honey Beige BB cream (I need to thank Tezza who mentioned this to me a while back - thanks girl!) and also Etude House, both being Korean brands and both having the same name for their shades. I don't know why I found that interesting but somehow I did... and really I shouldn't have because how many foundations under different brands have a shade called 'Natural Beige'...? 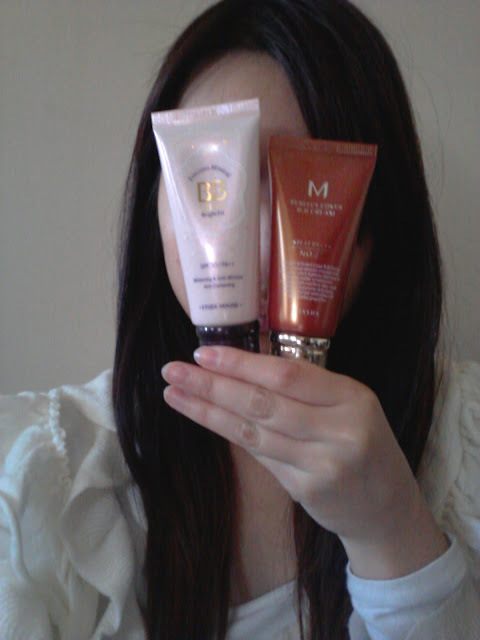 I ended up buying both as I couldn't decide which to choose from... and ta-da I've decided to do a side-by-side review! As always, my reviews are 100% my own honest opinions and you can choose to agree or disagree. This was not sponsored in any way. Already we can see an obvious difference between the boxes. Personally, the Etude House looks more girly/cutesy whereas the Missha box appears more sleek, shiny and generally more pricey. 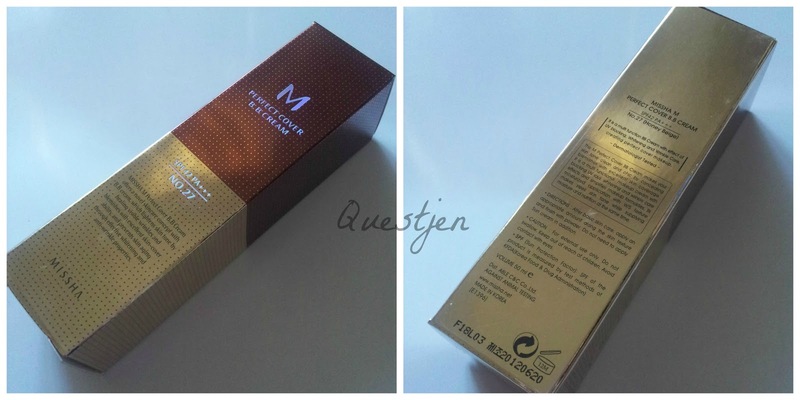 I'm a big fan of anything that's pink and sparkly so I guess the Etude House box is a better match for my taste/style but nonetheless, I still love the slightly more mature-looking packaging by Missha. The shades are similar though not the same despite both being called 'Honey Beige'. I will share a comparison picture where I use one on one side of my face and one on the other. 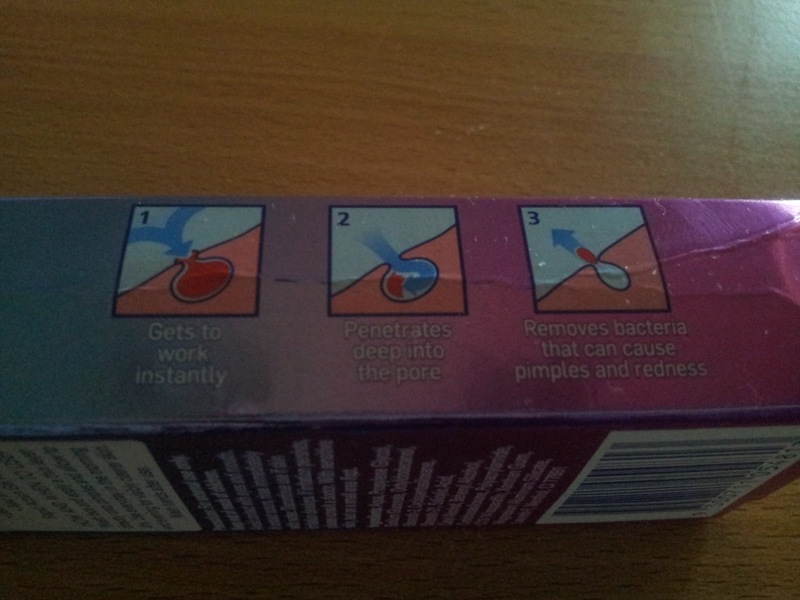 I'd say that they both have fairly equal coverage. Could you tell that I'm wearing two different BB Creams?! It looks like I'm wearing blush but nope I'm not! This BB Cream looks as though it brings out the natural flush to my cheeks which I guess for some isn't such a bad thing. 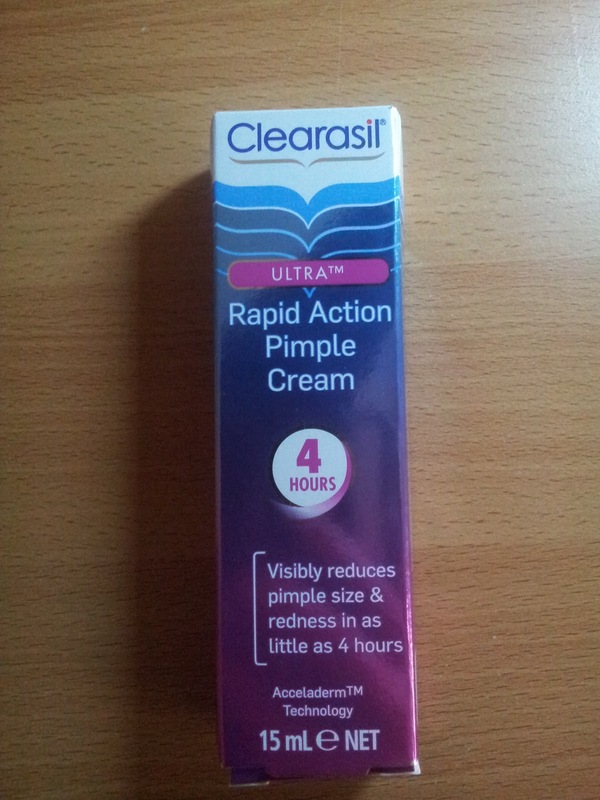 And look at the gloss on my cheek - some may find it oily-looking but I like it! My skin is dry and these BB creams moisturise my skin so well. I hardly have a glossiness to my face so I'm really liking the finish of these. If you're not a fan then you can easily apply some face powder on top for a matte finish. Now to the question - Is there one that I prefer? I can't comment on the whitening, anti-darkening and anti-wrinkle effects and to be honest I don't even know if all of that is legitimate. However I won't go against these claims as I have nothing to prove or disprove. The shades are similar but the undertones are slightly different. If you are unaware of undertones, Google can help you with that (I'm bad at explaining things). 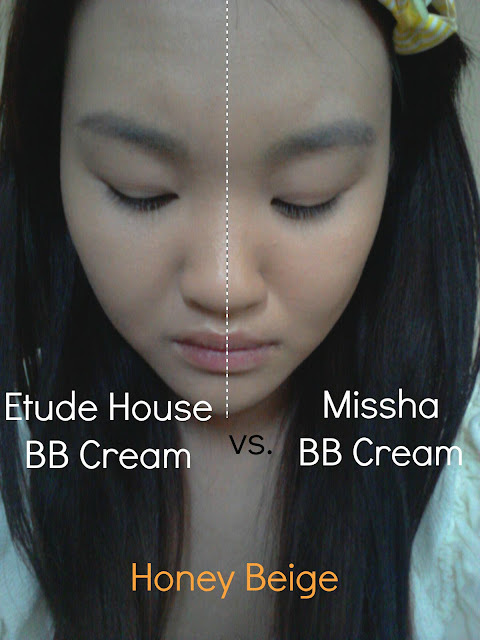 To me I feel that the Etude House BB Cream is more suited to those with cool undertones (I think this is what I have) and the Missha BB Cream is more suited to those with warm undertones (which probably explains the pinky/orangeness). Correct me if I'm wrong - 60g is more than 50mL, yes? I'm not sure if grams are exactly equal to millilitres but I've always thought that 1g roughly equates to 1mL. 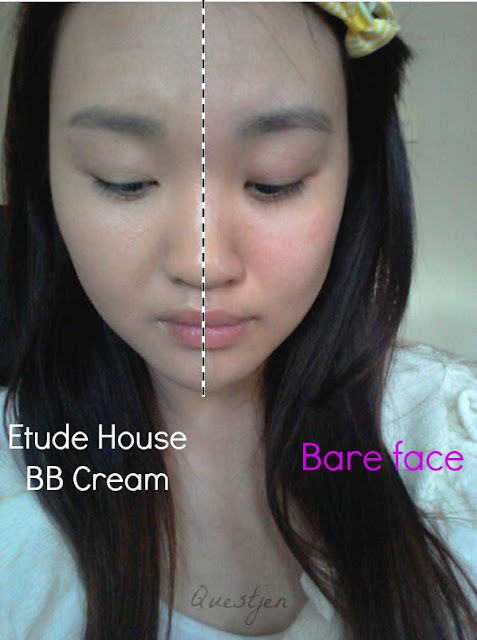 The Etude House BB Cream is 60g and Missha's is 50mL. I'm assuming that there is more product in the Etude House one. We're all aware that the higher the SPF the product is, the more sun protection it can offer, yes? It's important to protect our skin from sun damage from harmful UV rays and preventing premature skin aging and skin cancers. Although it sounds like a high difference between 30 and 42, it actually isn't. An SPF product of 30 blocks 97% of UVB rays and a product of SPF 45 blocks about 98% of rays, so it is only a 1% difference but overall it is better to choose a product with higher SPF. There is approximately a $10 AUD difference between the two. 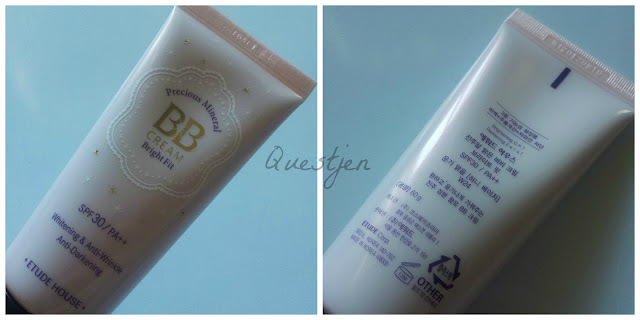 It's not surprising that the Missha BB Cream is a little bit more pricey because of the sleek, gold packaging which screams high-end. 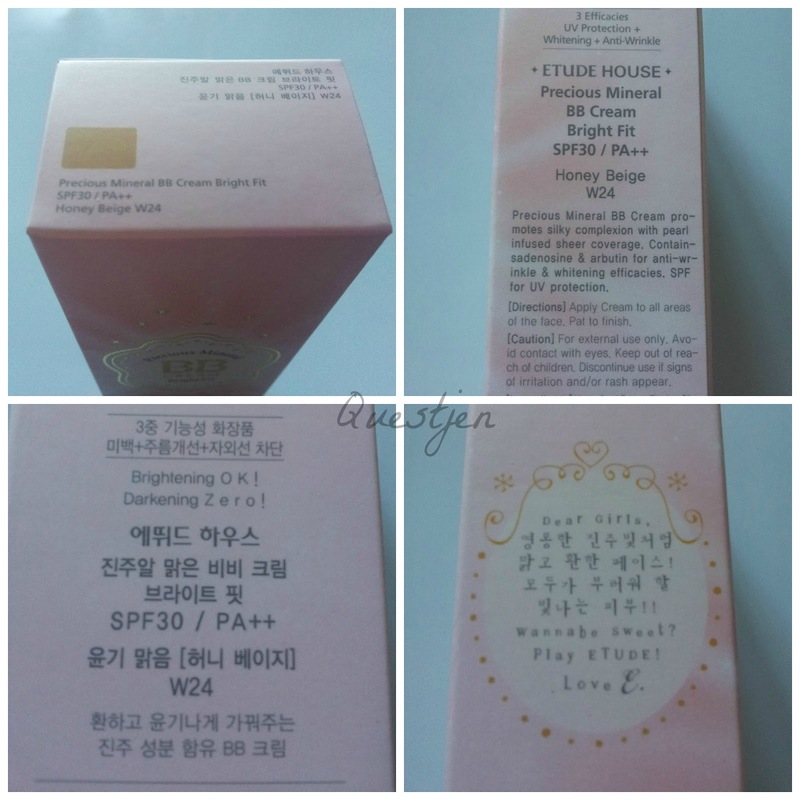 Etude House's packaging looks more suited to younger/girly girls and if they are targeting these users, having a more affordable BB cream is the way to go. Not trying to be stereotypical but from a marketing point of view, it could be seen that way. Any regrets on purchasing both? No, none at all! Purchasing both meant that I could do a comparison review and when one runs out, I'll still have the other one. And seeing as they were both Honey Beige, I was curious about which would suit me more or if they were both exactly the same. 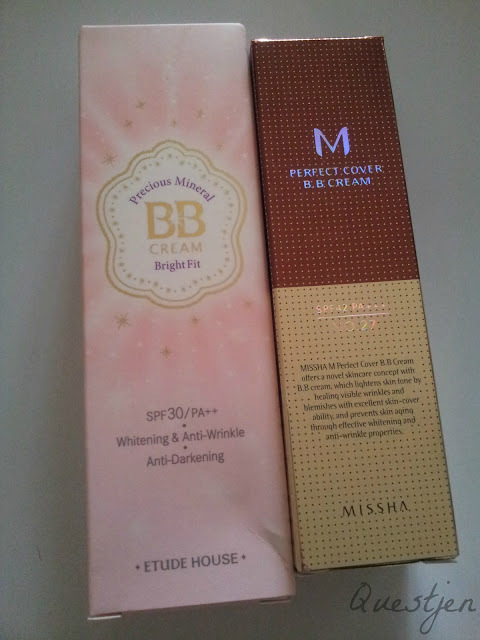 I am no longer curious and I finally own some Korean BB creams! It turns out that they're not exactly the same and have different undertones - something that wasn't aware of before purchasing. 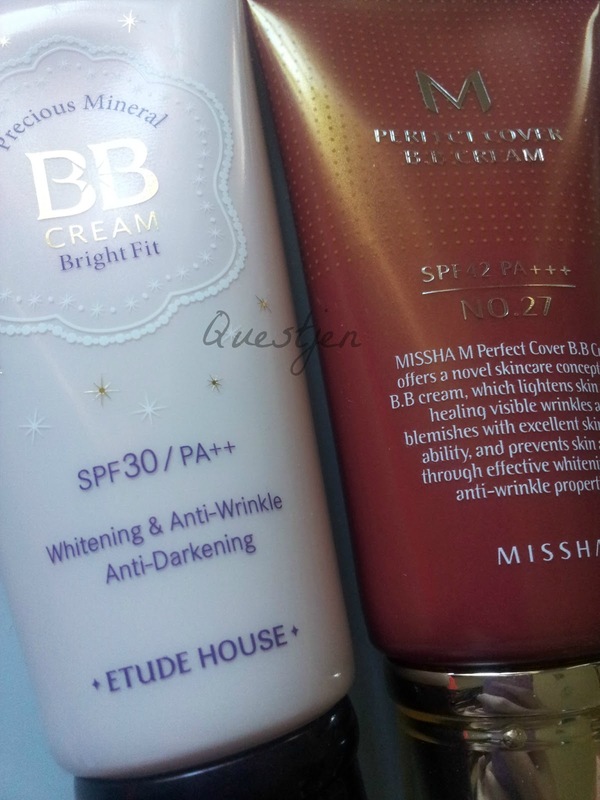 I've decided that I will use the Etude House BB Cream during Winter and the Missha BB Cream during Summer due to its warmer undertone being more suited to my tanned skin from the sun. 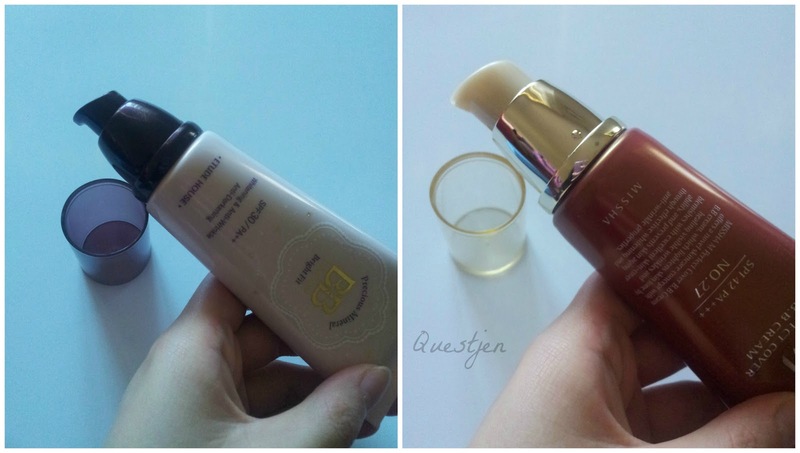 And because it's Winter over here now, you can guess which one I'd be using more, and liking a little more - the Etude House Precious Mineral BB Cream Bright Fit. Phew, that's a very long name! I won't do a pros and cons list for each as I reckon this review is long enough as it is. I've said everything that I want to say about them and what I may see as a pro or a con may not be the same for you. 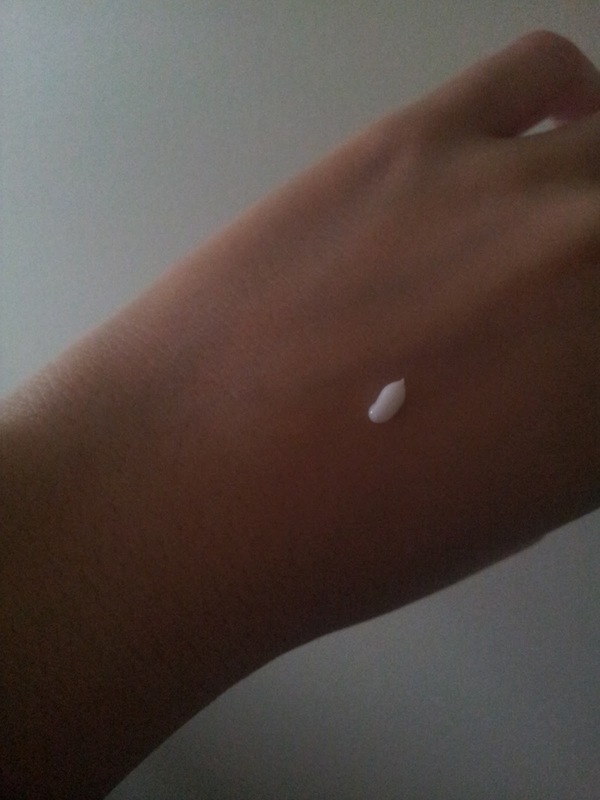 As I said before, it usually does come down to personal preference with products such as BB Creams. Which is your favourite BB Cream and why?